This in-depth portrait of English history's consummate stateswoman -- her "Justice, temper, magnanimity, judgment" (the queen's own assessment of what best fitted a monarch) -- focuses on politics rather than the cult of personality. And surely no one could be more politic than Elizabeth Tudor, whose prudent alliances catapulted England from a bankrupt minor kingdom to a great power. Her ability to win the absolute fidelity of her subordinates and to manipulate her favorites and suitors is legendary. 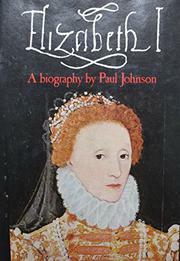 On the question of the Virgin Queen's virginity, Johnson quotes Elizabeth herself: "I do not live in a comer -- a thousand eyes see all I do, and calumny will not fasten on me forever," and suggests that only once, during a summer spent hunting with Robert Dudley, Earl of Leicester, did she come close to allowing her feelings to rule her head. She is styled here as an omni-competent cool pragmatist, but also a pacifist, who advocated tolerance toward Roman Catholics after her restoration of the Protestant Church of England, objected angrily to the beheading of her cousin Mary Queen of Scots, went to war with Spain reluctantly, and suffered personally over the execution of Essex for his conspiratorial folly. Elizabeth comes through as a model ruler, humble and charismatic, moral and resolute. Totally involving biography, perhaps even touched with relevance for our own era of crisis in world leadership.